The clashes between Christians, Muslims and security forces raged in Cairo yesterday, leading to 200 people being wounded. 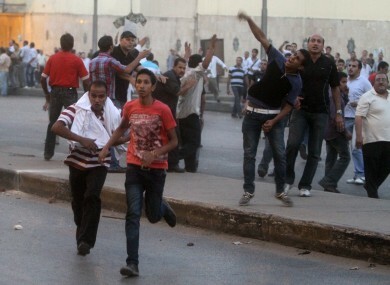 Clashes erupt at a protest of a recent attack on a church in Cairo Egypt, Sunday, Oct. 9, 2011. TWENTY FOUR PEOPLE were killed in clashes between Christians, Muslims and security forces in Egypt’s capital Cairo, yesterday. At least 200 people were wounded in what was described as the worst sectarian violence since the uprising that outsted Hosni Mubarak in February of this year. A number of people have been arrested but there are no details as yet as to whether they were Christians or Muslims. The clashes raged in downtown Cairo yesterday, drawing Christians angry over a recent church attack, Muslims and Egyptian security forces. The rioting had lasted until late into the night, bringing out a deployment of more than 1,000 security forces and armoured vehicles to defend the state television building along the Nile, where the trouble began. The clashes spread to nearby Tahrir Square, drawing thousands of people to the vast plaza that served as the epicenter of the protests that ousted Mubarak. On Sunday night, they battled each other with rocks and firebombs, some tearing up pavement for ammunition and others collecting stones in boxes. At one point, an armoured security van sped into the crowd, striking a half-dozen protesters and throwing some into the air. Protesters retaliated by setting fire to military vehicles, a bus and private cars. After midnight, mobs roamed downtown streets, attacking cars they suspected had Christian passengers. Christians, who make up about 10 percent of Egypt’s 80 million people, blame the country’s ruling military council for being too lenient on those behind a spate of anti-Christian attacks since Mubarak’s ouster. Prime Minister Essam Sharaf, addressing the nation in a televised speech, said the violence threatened to throw Egypt’s post-Mubarak transition off course. I call on Egyptian people, Muslims and Christians, women and children, young men and elders to hold their unity. The stone-throwing died down briefly, but then began to rage again. Protesters said the Copts are demanding the ousting of the governor, reconstruction of the church, compensation for people whose houses were set on fire and prosecution of those behind the riots and attacks on the church. Last week, the military used force to disperse a similar protest in front of the state television building. Email “24 killed and hundreds wounded during clashes in Egypt”. Feedback on “24 killed and hundreds wounded during clashes in Egypt”.